This Next Gen slot game invites you to have a very Foxin Christmas. Launch this 5 reel, 25 line slot and enjoy lots of Christmas treats. 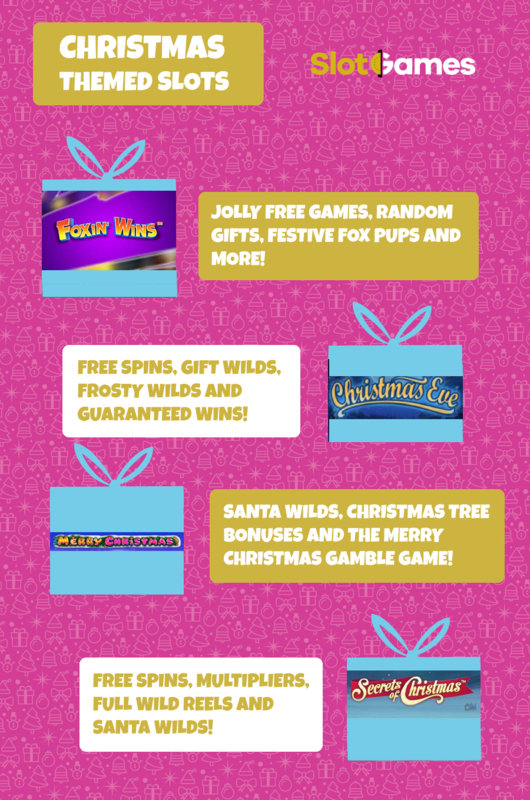 This includes free spins where prizes are doubled, random gifts to be awarded after any paid spin, and the Festive Fox Pups feature where a fox pup on your reel could turn into a symbol wild. There is also a SuperBet feature where you could maximise all of your wins. If you're a fan of the regular Foxin Wins slot, you will love this festive addition. There’s something magical about Christmas Eve, and that’s brought to life in the Christmas Eve slot. It's brought to us by Payson, and there are 5 reels with 1024 ways to win. There is lots to look forward to with this slot such as the frosty wild feature where the wild will turn into a frosty wild and freeze in place, and there’s a free spins feature where you can bag up to 20 free spins. With sticky wilds, you can enjoy a multiplier of up to 5x your bet for the rest of the free spins feature. The Merry Christmas slot is also a creation of Playson. It has 5 reels and 21 paylines. With the chance to win up to 5,000 times your line bet – there is a lot to be merry about. There is a free spins feature where you will get 15 free spins, and there are 2 wild symbols. You should also be on the lookout for a special bonus feature which is activated when the Christmas tree bonus symbol shows up on reels 1 and 5. Here you need to pick from a selection of Christmas trees and reveal multipliers. The final treat on this slot is that you can double your bet if you choose to take advantage of the gamble feature. The Secrets of Christmas slot was created by Net Ent and is full of Christmas cheer. You will be able to visit Santa’s house and find lots of Christmas toys. There is a free spins feature that is triggered when 3 or more scatters appear on your reel which will award you 10 free spins. Before that happens, you will be prompted to select from some Christmas gifts. This can include extra wild symbols. Wild reels, multipliers and even more free spins. Enjoy all of this with some jolly music in the background. If you are looking to get into the Christmas spirit, then make sure you give one of these slots a spin at Slot Games, remember making a deposit is now quicker than ever with our pay by mobile phone bill deposit method.